Please refer to our stock # 1095 when inquiring. This very well carved black and celadon jade (nephrite and jadeite) bead necklace is an early 20th century product. All the beads are well carved; it is quite possible this was a court necklace. After being restrung, it is a beautiful 31” long necklace now. It has 36 black beads and 4 celadon beads. 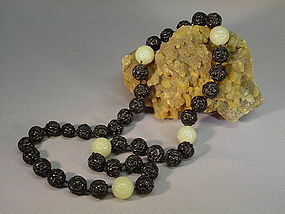 The black beads are about 11/16” in diameter; the celadon beads are about 13/16” in diameter. The colors are very even and the carvings are superb. It weighs 9 oz and it is in excellent condition.